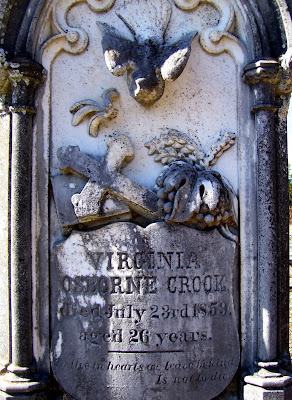 This tombstone for Virginia Crook (d. 1859), located at Waverly Hall Cemetery in Harris County, Georgia, contains several Christian symbols. The other items I have not often seen are the grapes and wheat. Grapes alone could symbolize the blood of Christ. Wheat alone may depict immortality and resurrection. When the two are shown together, it is thought to represent wine, bread, and Holy Communion.